With the new school year beginning, Special Collections has brought in 21 new manuscripts for the fall semester for professors, students, and enthusiasts to enjoy and learn from. Some institutions do not have a collection of manuscripts for students to learn from and use as primary sources in their papers. Even though we are fortunate to have a Medieval Manuscript collection already, by acquiring these on loan for the semester, we are allowing students to gain a broader understanding of the Middle Ages and to experience something new. Special Collections will be welcoming the manuscripts to their collection for the Fall 2018 Semester, arriving on August 27th and leaving mid November. 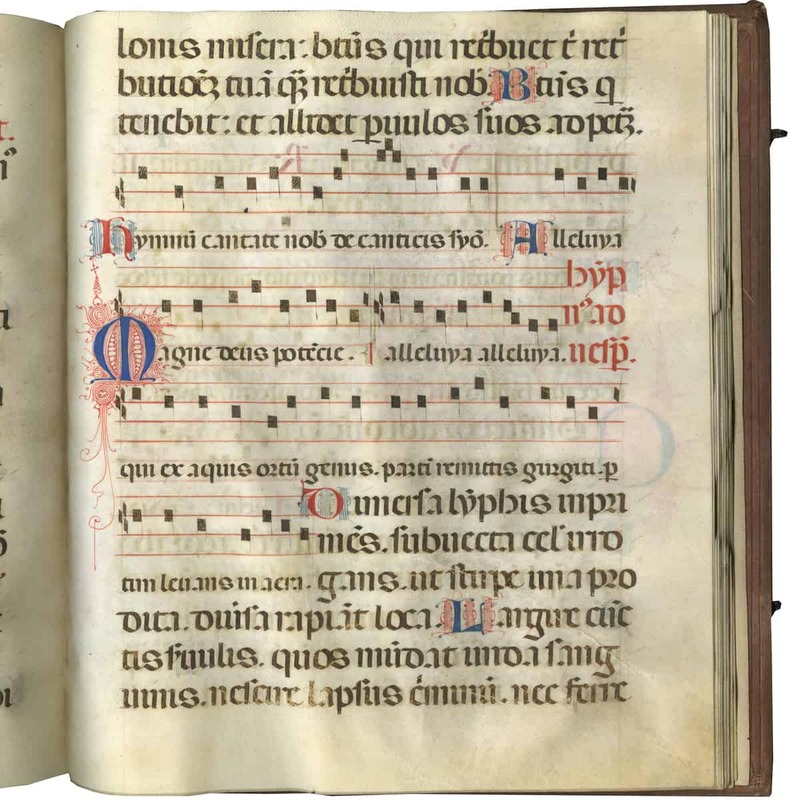 The manuscripts were written throughout Europe from the 13th century to the 19th century, and each manuscript has a diverse subject including the lives of the saints, school books, humanism, liturgy and canon law. One of the manuscripts, Lotario Dei Segni’s De miseria humanae conditionis (On the Misery of the Human Condition), has been cited by famous authors, including Chaucer and Christine de Pizan. 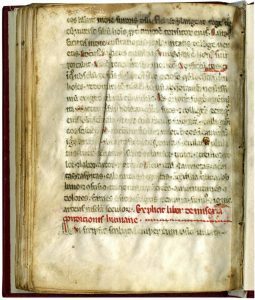 This medieval manuscript is a reflection on the Middle Ages. Saint Benedict’s Regula sancti Benedicti and Saint Augustine’s Regula sancti Augustini episcopi are pocket-sized manuscripts containing foundation documents of early Western monasticism. 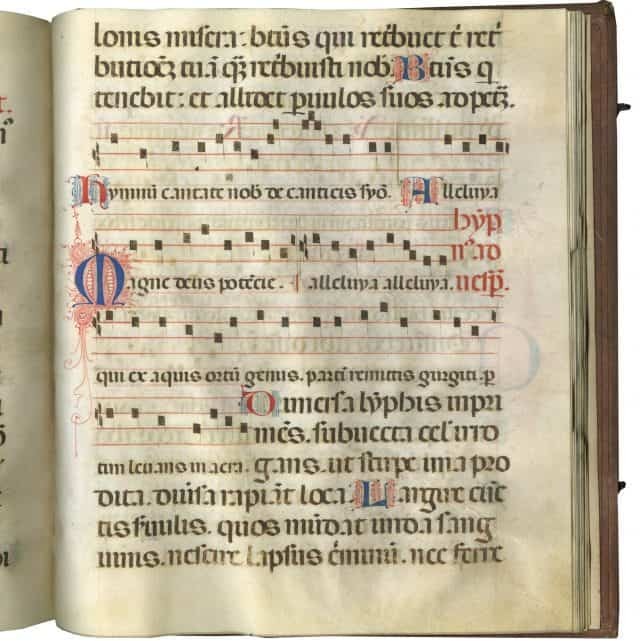 Even though monks were not allowed any personal property of their own, there is still evidence that a Benedictine monk or abbot had owned the manuscript in the 15th century. Along with these manuscripts, there may be some that have missing leaves. However, those missing leaves add more to the story than if they were still bound with the manuscript. 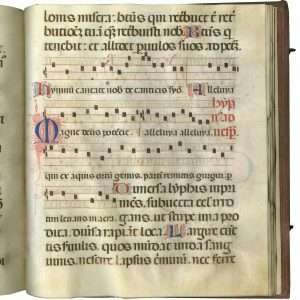 An incomplete Noted Choir Psalter and Hymnal is bound out of order and is missing numerous leaves; however, it still represents the opportunity to acquire a liturgical manuscript from Northern Italy. There is so much to learn from these manuscripts, and we hope you can come in and enjoy them. In addition to the manuscripts coming to Special Collections for classroom use, every Tuesday from 4 p.m.-7 p.m. Aug. 28- Nov. 13, we will showcase a few manuscripts during our open houses. To read more about the manuscripts before they come, visit www.textmanuscripts.com. For those interested in seeing the manuscripts, for class use or personal interest, please contact us at lib-spec@uiowa.edu. We will also be welcoming an international specialist from Les Enluminures to give a lecture about the manuscripts. Dates are TBD, so stay tuned for more information.